Located on the most privileged position on a private hill of Agia Pelagia, you find an amazing villa providing harmony between the rugged Cretan nature and the endless blue horizon towards the sea. Located in a privileged position on a private hill of Agia Pelagia, in the region of Heraklion in Crete this villa with private pool offers a sense of harmony between the rugged Cretan nature and the endless blue horizon. Combining traditional elements of the island of Crete and modern aesthetics, Blue Key Villa can accommodate up to 10 persons offering them a memorable stay. Blue Key Villa which faces towards the Aegean Sea completed a total renovation in 2016 with an addition of a brand new pool area. This amazing villa offers a perfect blend of traditional and modern aesthetics; handpicked original art, and each room is carefully designed to inspire easy living whilst admiring the breathtaking blue sea view or evening colours from the sunset. This incredible view can be enjoyed even from the privacy of the bedrooms. The property's numerous terraces are equipped with several sun beds and loungers, which makes it a perfect setting for star gazing or simply reading a book. There are two well equipped kitchens ready to accommodate your cooking skills and host private dinners. The outdoor areas are a treat; Amazing gathering spots includes lounging and al fresco dinning sections on the various terrace layers of the property, either protected from the sun and winds or meant for sunbathing. The brand new infinity pool area, complement the serene sea view ambient, while a variety of beaches can be reached within 5 minutes by car. The private pool which is chlorine free contains salt water and can be heated at an extra cost (please contact us for further information). A private chef on demand can be an addition to this sanctuary, offering a fantastic culinary experience. 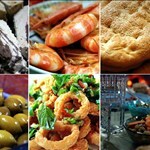 Within 5-10 minutes by car you will also find a good selection of simple Cretan tavernas, restaurants and supermarkets. Guests will have access to all 8000 square meters of this property to familiarize themselves to local flora, natural grasses and wild and aromatic plants that characterizes the island’s habitat. A personal qualified yoga trainer will also be available on demand to offer you the opportunity to meditate whilst posing towards the Aegean Sea on one of the numerous large natural rocks. 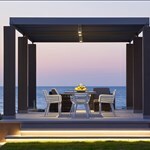 This amazing villa is perfect for families, groups of friends, nature lovers and guests who appreciates Crete in privacy, away from the masses. The villa combines peacefulness and comfort in close proximity to Heraklion for those who wish visit galleries and the museums or to get a taste from the city’s bustling nightlife. Blue Key villa is located on a private hill in Agia Pelagia at the region of Heraklion in Crete. Agia Pelagia is a beach resort approximately 20km west of Heraklion on the west side of a long peninsula famous for its calm waters. A variety of small coves with turquoise waters, either sandy or pebbled are excellent for swimming whilst restaurants, cafes, bars and water sports can fulfill any guest's requirements. This is also the beach where several ruins of the ancient port city Apollonia have been extracted. Walking along the cape of Souda (a different Souda to the ones of Chania or Plakias) passing by the shrine, after a few steps you will be above the most beautiful beach of Agia Pelagia, Fylakes. Fylakes are small bays with turquoise waters sheltered by the tall rocks of Cape Souda. In order to access Fylakes you have to go down along the rocky coast that lead to the beach or swim or take a sea bicycle. We consider this small beach as one of the most beautiful on the North coast of Crete, so make sure not to miss it. 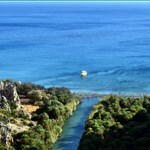 Other nearby options includes Psaromoura, Mononaftis, Mades, Lygaria and Paliokastro beach. Other facilities in Agia Pelagia include supermarkets, pharmacy, ATM, doctors, beach showers, local products markets, diving center, little boat excursions.